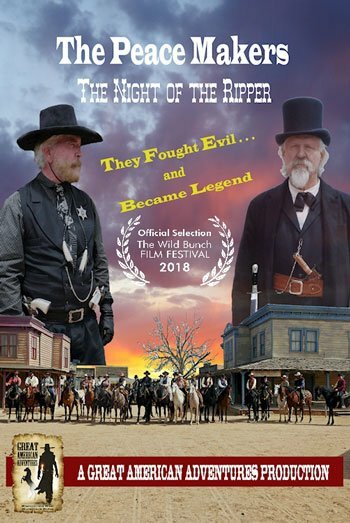 Ride the REEL West, aka "The Peace Makers: The Night of the Ripper" garnered 8 award nominations and received a total of 5 awards at the annual Wild Bunch Film Festival in October 2018. The awards were for: Best Screenwriter - Honorable Mention; Best Comedy Western - Festival Directors Choice; 2nd Place Best Movie Poster; and two awards for 3rd and 4th Place Best Child Actor. Other nominations included: Marcie Shaw for Best Female Lead; Gary Carpenter for Best Male Lead; and, Steve Shaw for Best Supporting Male. Summary: In April, 2016, a cadre of 50 plus individuals (30 riders + 10 non-riders + behind the scenes personnel) gathered in Santa Fe, NM with the hopes of becoming "film legends" - or at least experience what it takes to make a Western movie. The result was "The Peace Makers: The Night of the Ripper" - an 80-minute film that took us to movie locales where Westerns have been made. Our finale showdown, between "The Peace Makers" and "Ripper's Gang," was filmed at Bonanza Creek Ranch. Guns blazed, blood spilled, and horses galloped (all in a controlled environment, of course). In fact, everything we did during the week was "movie" oriented, including the places we visited, such as Cathy Smith's (Emmy Award winning costumer for "Son of the Morning Star") Nambe Trading Post where several of her costumes from such films as "Wild Bill," "Son of the Morning Star," "Dances with Wolves" and more are on display; El Rancho de las Golondrinas; Copper Canyon; the Black Dog Cantina (built and owned by Bill Mann) and more. Our concept of immersing our riders/actors into the production aspects of Western film making was realized. There was 100% client satisfaction - everyone wants to come back and do it again. Read the testimonials!! In addition to experiencing filming a movie and working behind the scenes, a final DVD of the film was provided, as well as a movie poster and photo album was offered to not only keep our most excellent memories alive, but to share with family and friends. No one walked away from this experience disappointed. The annual Wild Bunch Film Festival provided us with an official Laurel to be placed on the poster of our film!! The question remains: Will we offer this movie-making experience again? This was both "unique" and "special." Special in that this was the most ambitious, most successful and most stressful event my wife and I have produced. It took 8 days to film and 6 weeks to edit. Lots of hours went into pre-production and post-production work. We even had a traditional movie "wrap" party... good food and some alcohol... and a few acting awards of our own - it doesn't get much better for a bunch of actors that braved long days, chilly, snowy, windy weather and me yelling at them all the time ("back to one!" "quiet on the set!" "Please be quiet!" "Where the heck is so-and-so for their upcoming scene?" "Say your lines like this!" and on-and-on). In fact, as we were contracting with local movie studios for time to film, Hollywood was competing for the same time. During filming we had to share space with Hollywood... both of us filmed at Bonanza Creek Ranch one day, and they called and asked for us to give them our time frame (fortunately I had a contract!!). Our answer: Another script is being written. We'll consider doing this again if we can re-create the "magic" that followed us in our first endeavor. All those pieces have to come back together again... and it takes a lot of time to make that happen. We're not sure when. What helped me tremendously when I was writing the original script was that all the "actors" were repeats from previous rides. Thirty repeats signed up within 48 hours of notifying them of this new adventure. I knew them, knew what they looked like, how they walked and talked... all the nuisances that makes a great on-screen character. Thus, each participant had a role written expressly for him/her... even the non-riders!! And they did not disappoint! They knew their lines & had rehearsed! I can't imagine doing this for someone I have never met, though it can be done. My point: if this adventure appeals to you, consider another ride before I decide to do the next movie ride. My "repeat" riders will have priority for this "special" ride... because it makes it easier for me, they know me and accept me yelling "quiet on the set" at them, and they know each other. The camaraderie on this set was excellent... all good friends having a great time while experiencing what few people get to experience. Enough about our 1st movie ride... suffice it to say, it exceeded everyone's expectations. Next time I will have to raise the bar and produce a better - if not a bit shorter - film. “Custer’s Ride to Glory” – I loved Errol Flynn in They Died With Their Boots On. “Jeremiah Johnson’s Wilderness Ride” – Robert Redford!! Need I say more? “Billy the Kid’s Regulator Ride” – Val Kilmer is my definitive Billy! “Butch Cassidy’s Hole-in-the-Wall Ride” – Paul Newman and again, Bob Redford! “Wyatt Earp’s Vendetta Ride” – I can’t see the movie Tombstone enough!!! “The Great Train Robbery” – Tyrone Power and Henry Fonda as Jesse & Frank James!! It appears all my rides are movie based… wonder if this has occurred to any of my riders? The history I include on these rides make them that more special. On some rides, we have actually ridden to a movie studio. Old Tucson Studios isn’t what it used to be, after it burned down many years ago… but we rode down her main street. Mescal Studios, where the film Tombstone and many others were filmed… yep, we rode all over that area. But it is really dilapidated and about ready to fall down. Yet, my riders keep telling me how awesome these movie sets are – but I knew different. I’ve had the opportunity and privilege to do some background acting work and have visited some truly awesome, working Western movie sets. And one day it hit me … if everyone thinks these old sets we’re seeing are “awesome,” too bad they can’t see what I’ve seen… hum and duh… that proverbial light bulb went off over my head!! Maybe they can!! This idea rummaged in my head for several years. How do I establish a horseback ride in conjunction with seeing Western movie sets? Some of the sets I have been on (like Melody Ranch in California when I did Season Two for the HBO series Deadwood) wouldn’t work – it’s smack-dab in the center of a neighborhood of homes. Nor would the sets where I did about a dozen or more episodes of Wild West Tech for the History Channel and the movie Hell to Pay – again in California, and not enough around it to warrant a ride. Disney’s Western set (where I did the Western film Brothers in Arms) is just down the road, but again, too close to civilization. The two unique Western towns where I spent 6 weeks in New Mexico filming Disney’s The Lone Ranger were torn down when the movie wrapped. This idea of mine was difficult at best. I’ve also had the opportunity to spend time at a wonderful Western movie set - still active - called Bonanza Creek Ranch, located just south of Santa Fe, New Mexico. I did a Country Western music video here for Clay Walker about his Jesse James song. And I did two short films here: Las Vegas New Mexico, 1875 and a commercial called Yellow Fella. When I spent about 6 weeks on this set doing A Million Ways to Die in the West my mind was made up. This huge, working set was truly awesome and some of my favorite films have been made here. All I had to do was contact the owner and see if a group of riders could have access to it. Along the way – and you need to know how my active mind works – I decided it would also be fun to actually film a movie at various locations in and around the Santa Fe area, New Mexico where Westerns have been made. All I needed was a script writer, a photographer, a film maker, an editor, costumer, armorer, etc. John Ford was known to say, “My name is John Ford, I make Westerns.” My cowboy hat is off to John Ford! Here’s my personal take, “I create Western events.” If I set my mind to it, I will create it… unless I hit a brick wall… and I did hit it a time or two creating this event – it took several years to pull this off. But luck and tenacity does pay off! I am pleased to announce I have created what I now know to be the most phenomenal horseback ride in my stable of rides. Ladies and Gentlemen: We’re headed to Santa Fe, New Mexico for this ride – and yes it will be historic. We get two full days at Bonanza Creek Ranch – yes, I have contracted with them. We’ll also ride the canyons and arroyos where they filmed Silverado, 3:10 to Yuma, Cowboys and Aliens, Young Guns and other Westerns. And… we’ll make a movie. Not a full length film… we don’t have the time or budget. Just a small, independent film – perhaps between 30 minutes to 45 minutes in length. It depends on how good you all are on film (and how many takes we have to take of you). The script will be original, and based on the number of riders we have. We have a concept of the story-line. We will wait until 90 days prior to this event to write it so we know how many riders/actors will be participating with dialogue. I’ll get the non-riding spouses in the film as well – we’ll need background actors and others that don’t have to be on a horse. Each of the riders will have lines and will be featured, with close-ups; heck, if you have an idea for a character you’d like to be, let me know – but no guarantees. You’ll need costuming… if you don’t have Western period clothing and guns, you will have to buy them or rent them. I’ll can make suggestions where to get all the stuff. Remember, you could be a good guy or a bad guy or girl. Some will live; some will die (in the movie of course). We’ll film death scenes at the end of the week, so you will be busy the entire week. Yes, we will be using guns: we’ve have blanks and an armor to ensure our safety. We will not only have a great week of riding, but of filming too. Most importantly, I want you to have the same experience I have had on the various movie sets I have been on… you just won’t be able to work with wonderful movie stars and see them in action – that’s because you will be the featured player in this film – each of you!! The point to this ride is the experience. The final DVD movie is like getting photos from a vacation. Don't expect a Hollywood production. We don't have the time or the budget to do what Hollywood does. But we will experience what actors and crew members experience on a movie set. And we get to ride in some fantastic country where Westerns have been filmed. Some days, depending on the script, we will get up early to catch that sun coming up. Some days will be long… we have to film so many pages of script each day to complete the project. You will learn what: “Back to one!” “Sounds up!” “Cameras up!” "Rolling!" “Action!” and more actually means. You’ll learn to hit your mark and say your line… maybe while horseback!! Because there will be interior and exterior shots, we won’t be riding every day. No reason to have horses sitting outside when we’re shooting an interior scene inside a saloon. And there will be location shoots too, especially with the horses. No movie is filmed in sequence. So our film will need to be edited. The goal will be to have a completed film back to you in about 60 days. This won’t be released in the movie theaters… sorry about that. But you will have your own film to show your friends, neighbors and relatives. Any still photos we take of you, you’ll get those as well. Those that have been with me before… we’ve played cowboy/cowgirl… now let’s film it! Now… Everyone back to one! Everyone ready? Cameras Up! Rolling…. And Action!!! Bonanza Creek Ranch is still an active, all-inclusive film location located in the foothills of New Mexico, south of Santa Fe. The ranch, spread out over some 14,000 acres has been host to more than 130 movies, as well as various videos, commercials and catalog shoots filmed here. The town is more than your typical Hollywood building facades. These buildings are all four-sided, usable buildings. And we will have the use of all these buildings. Current film productions have only enhanced the awesomeness of this movie locale. In fact, I called about going out there to take a few photos for this website... the sets are closed due to a film production in process. When I say this is an active set, is it ever!!! We’re trying to find some “wiggle-room” when a Hollywood production (or international production) is not leasing out this massive ranch for a film. Keeping our fingers crossed that our dates will remain open and Hollywood will not be moving in on us, we chose our dates – hopefully wisely. In order to acquire this foothold on such a popular movie location, I signed a contract for two days (gulp!!). If all goes according to plan, we’ll have the “movie town” and possibly the entire ranch to ourselves, including the other sets (there is much more than just the Western town). The movie town continually enlarges, due to various productions adding buildings to get their own concept on film. This set is surrounded by rolling hills and mesas – it is as though you have truly stepped back in time, to the 1880s. This set contains a saloon, bank, hotel, blacksmith shop, large barn and connecting shops. There is electricity in all the buildings. It all started with the 1955 James Stewart movie “The Man From Laramie” when Hollywood discovered the rolling hills and mesas near Santa Fe, New Mexico. And the rest continues to be history. They are giving us a great group rate of $79 + tax per night. They work with movie production crews all the time. It would be great if everyone stayed at this location. If you prefer another location, please understand we will depart each morning from and arrive each evening back to this location. Getting here in the morning and getting back to wherever you need to be at the end of the day will be up to you. See ya on the set!! and what we can accomplish… no easy task!! 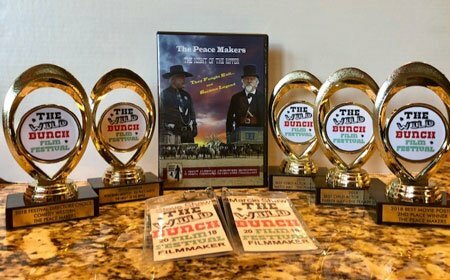 Ride the REEL West, aka “The Peace Makers: The Night of the Ripper” garnered 8 award nominations and received a total of 5 awards at the annual Wild Bunch Film Festival in October 2018. The awards were for: Best Screenwriter – Honorable Mention; Best Comedy Western – Festival Directors Choice; 2nd Place Best Movie Poster; and two awards for 3rd and 4th Place Best Child Actor. Other nominations included: Marcie Shaw for Best Female Lead; Gary Carpenter for Best Male Lead; and, Steve Shaw for Best Supporting Male. Summary: In April, 2016, a cadre of 50 plus individuals (30 riders + 10 non-riders + behind the scenes personnel) gathered in Santa Fe, NM with the hopes of becoming “film legends” – or at least experience what it takes to make a Western movie. The result was “The Peace Makers: The Night of the Ripper” – an 80-minute film that took us to movie locales where Westerns have been made. Our finale showdown, between “The Peace Makers” and “Ripper’s Gang,” was filmed at Bonanza Creek Ranch. Guns blazed, blood spilled, and horses galloped (all in a controlled environment, of course). In fact, everything we did during the week was “movie” oriented, including the places we visited, such as Cathy Smith’s (Emmy Award winning costumer for “Son of the Morning Star”) Nambe Trading Post where several of her costumes from such films as “Wild Bill,” “Son of the Morning Star,” “Dances with Wolves” and more are on display; El Rancho de las Golondrinas; Copper Canyon; the Black Dog Cantina (built and owned by Bill Mann) and more. Our concept of immersing our riders/actors into the production aspects of Western film making was realized. There was 100% client satisfaction – everyone wants to come back and do it again. Read the testimonials!! In addition to experiencing filming a movie and working behind the scenes, a final DVD of the film was provided, as well as a movie poster and photo album was offered to not only keep our most excellent memories alive, but to share with family and friends. No one walked away from this experience disappointed. The annual Wild Bunch Film Festival provided us with an official Laurel to be placed on the poster of our film!! The question remains: Will we offer this movie-making experience again? This was both “unique” and “special.” Special in that this was the most ambitious, most successful and most stressful event my wife and I have produced. It took 8 days to film and 6 weeks to edit. Lots of hours went into pre-production and post-production work. We even had a traditional movie “wrap” party… good food and some alcohol… and a few acting awards of our own – it doesn’t get much better for a bunch of actors that braved long days, chilly, snowy, windy weather and me yelling at them all the time (“back to one!” “quiet on the set!” “Please be quiet!” “Where the heck is so-and-so for their upcoming scene?” “Say your lines like this!” and on-and-on). In fact, as we were contracting with local movie studios for time to film, Hollywood was competing for the same time. During filming we had to share space with Hollywood… both of us filmed at Bonanza Creek Ranch one day, and they called and asked for us to give them our time frame (fortunately I had a contract!!). Our answer: Another script is being written. We’ll consider doing this again if we can re-create the “magic” that followed us in our first endeavor. All those pieces have to come back together again… and it takes a lot of time to make that happen. We’re not sure when. What helped me tremendously when I was writing the original script was that all the “actors” were repeats from previous rides. Thirty repeats signed up within 48 hours of notifying them of this new adventure. I knew them, knew what they looked like, how they walked and talked… all the nuisances that makes a great on-screen character. Thus, each participant had a role written expressly for him/her… even the non-riders!! And they did not disappoint! They knew their lines & had rehearsed! I can’t imagine doing this for someone I have never met, though it can be done. My point: if this adventure appeals to you, consider another ride before I decide to do the next movie ride. My “repeat” riders will have priority for this “special” ride… because it makes it easier for me, they know me and accept me yelling “quiet on the set” at them, and they know each other. The camaraderie on this set was excellent… all good friends having a great time while experiencing what few people get to experience. Enough about our 1st movie ride… suffice it to say, it exceeded everyone’s expectations. Next time I will have to raise the bar and produce a better – if not a bit shorter – film. 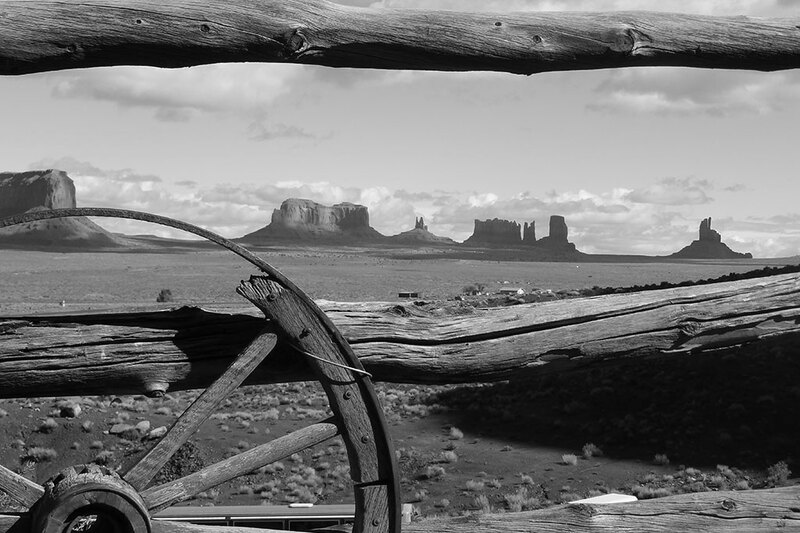 I love the Old West… and certainly its history. As a kid, I loved to play Cowboys and Indians; always wore by favorite cowboy boots, beloved cowboy hat, fringe shirt and buscadero holster-rig and play-guns… the odor of caps being fired from my six-shooter permeated the backyard most weekends. It’s sort of like that now for me – ha!! But why am I so fascinated by the myth and history of the Old West? I’ll tell you why…. I grew up when Westerns dominated the TV shows and the movies. And of course, all the reruns of those great Western movies made in the 1940’s and 1950’s played most Saturdays on our small TV set in the living room… Dad loved them too, not to mention all the Westerns on TV during the 1960’s. It appears all my rides are movie based… wonder if this has occurred to any of my riders? The history I include on these rides make them that more special. On some rides, we have actually ridden to a movie studio. Old Tucson Studios isn’t what it used to be, after it burned down many years ago… but we rode down her main street. Mescal Studios, where the film Tombstone and many others were filmed… yep, we rode all over that area. But it is really dilapidated and about ready to fall down. Yet, my riders keep telling me how awesome these movie sets are – but I knew different. I’ve had the opportunity and privilege to do some background acting work and have visited some truly awesome, working Western movie sets. And one day it hit me … if everyone thinks these old sets we’re seeing are “awesome,” too bad they can’t see what I’ve seen… hum and duh… that proverbial light bulb went off over my head!! Maybe they can!! This idea rummaged in my head for several years. How do I establish a horseback ride in conjunction with seeing Western movie sets? Some of the sets I have been on (like Melody Ranch in California when I did Season Two for the HBO series Deadwood) wouldn’t work – it’s smack-dab in the center of a neighborhood of homes. Nor would the sets where I did about a dozen or more episodes of Wild West Tech for the History Channel and the movie Hell to Pay – again in California, and not enough around it to warrant a ride. Disney’s Western set (where I did the Western film Brothers in Arms) is just down the road, but again, too close to civilization. The two unique Western towns where I spent 6 weeks in New Mexico filming Disney’s The Lone Ranger were torn down when the movie wrapped. This idea of mine was difficult at best. I’ve also had the opportunity to spend time at a wonderful Western movie set – still active – called Bonanza Creek Ranch, located just south of Santa Fe, New Mexico. I did a Country Western music video here for Clay Walker about his Jesse James song. And I did two short films here: Las Vegas New Mexico, 1875 and a commercial called Yellow Fella. When I spent about 6 weeks on this set doing A Million Ways to Die in the West my mind was made up. This huge, working set was truly awesome and some of my favorite films have been made here. All I had to do was contact the owner and see if a group of riders could have access to it. Along the way – and you need to know how my active mind works – I decided it would also be fun to actually film a movie at various locations in and around the Santa Fe area, New Mexico where Westerns have been made. All I needed was a script writer, a photographer, a film maker, an editor, costumer, armorer, etc. If I set my mind to it, I will create it… unless I hit a brick wall… and I did hit it a time or two creating this event – it took several years to pull this off. But luck and tenacity does pay off! I am pleased to announce I have created what I now know to be the most phenomenal horseback ride in my stable of rides. Ladies and Gentlemen: We’re headed to Santa Fe, New Mexico for this ride – and yes it will be historic. We will not only have a great week of riding, but of filming too. Most importantly, I want you to have the same experience I have had on the various movie sets I have been on… you just won’t be able to work with wonderful movie stars and see them in action – that’s because you will be the featured player in this film – each of you!! The point to this ride is the experience. The final DVD movie is like getting photos from a vacation. Don’t expect a Hollywood production. We don’t have the time or the budget to do what Hollywood does. But we will experience what actors and crew members experience on a movie set. And we get to ride in some fantastic country where Westerns have been filmed. Some days, depending on the script, we will get up early to catch that sun coming up. Some days will be long… we have to film so many pages of script each day to complete the project. You will learn what: “Back to one!” “Sounds up!” “Cameras up!” “Rolling!” “Action!” and more actually means. You’ll learn to hit your mark and say your line… maybe while horseback!! Because there will be interior and exterior shots, we won’t be riding every day. No reason to have horses sitting outside when we’re shooting an interior scene inside a saloon. And there will be location shoots too, especially with the horses. No movie is filmed in sequence. So our film will need to be edited. The goal will be to have a completed film back to you in about 60 days. This won’t be released in the movie theaters… sorry about that. But you will have your own film to show your friends, neighbors and relatives. Any still photos we take of you, you’ll get those as well. Those that have been with me before… we’ve played cowboy/cowgirl… now let’s film it! Bonanza Creek Ranch is still an active, all-inclusive film location located in the foothills of New Mexico, south of Santa Fe. The ranch, spread out over some 14,000 acres has been host to more than 130 movies, as well as various videos, commercials and catalog shoots filmed here. The town is more than your typical Hollywood building facades. These buildings are all four-sided, usable buildings. And we will have the use of all these buildings. Current film productions have only enhanced the awesomeness of this movie locale. In fact, I called about going out there to take a few photos for this website… the sets are closed due to a film production in process. When I say this is an active set, is it ever!!! We’re trying to find some “wiggle-room” when a Hollywood production (or international production) is not leasing out this massive ranch for a film. Keeping our fingers crossed that our dates will remain open and Hollywood will not be moving in on us, we chose our dates – hopefully wisely. In order to acquire this foothold on such a popular movie location, I signed a contract for two days (gulp!!). If all goes according to plan, we’ll have the “movie town” and possibly the entire ranch to ourselves, including the other sets (there is much more than just the Western town). The movie town continually enlarges, due to various productions adding buildings to get their own concept on film. This set is surrounded by rolling hills and mesas – it is as though you have truly stepped back in time, to the 1880s. This set contains a saloon, bank, hotel, blacksmith shop, large barn and connecting shops. There is electricity in all the buildings. It all started with the 1955 James Stewart movie “The Man From Laramie” when Hollywood discovered the rolling hills and mesas near Santa Fe, New Mexico. And the rest continues to be history.